By the time Günther began work at the British Museum in 1857 he had already completed a program in theology, been awarded M.A. and Ph.D. diplomas on the strength of zoological projects, finished his medical degree, and written the advanced-for-its-time work Handbuch der Medicinischen Zoologie (published in 1858). He soon settled down to a life of research focusing on classification and life histories, particularly of fishes, but nearly as significantly of reptiles and amphibians (he was, for example, the first to recognize the ancient status of the tuatara). Among many works of import his greatest project was probably the Catalogue of the Fishes in the British Museum, published in eight volumes over an eleven year period. 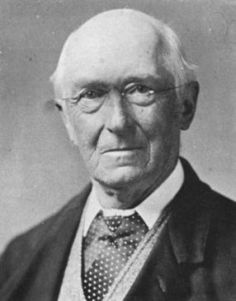 A very effective administrator, he is additionally remembered for his bibliographic efforts--especially as the founder of the Record of Zoological Literature, which he edited for six years. Günther was one of the first to voice support for his colleague P. L. Sclater's faunal regions system through a paper published in the Proceedings of the Zoological Society of London in 1858, and in general was an early champion of the developing field of zoogeography. --born in Esslingen, Württemberg, Germany, on 3 October 1830. --dies at Kew Gardens, Surrey, England, on 1 February 1914. --Oxford Dictionary of National Biography, Vol. 24 (2004). --A Century of Zoology at the British Museum Through the Lives of Two Keepers 1815-1914 (1975). --Proceedings of the Royal Society of London, Ser. B., Vol. 88(608) (1915): xi-xxvi. --Nature, Vol. 92 (1914): 664-666.